Hey guys n gals. Wanted to chime in while I finally got a minute. Haven’t been around for the past month or so. I went back on the clock after 11 years of retirement. 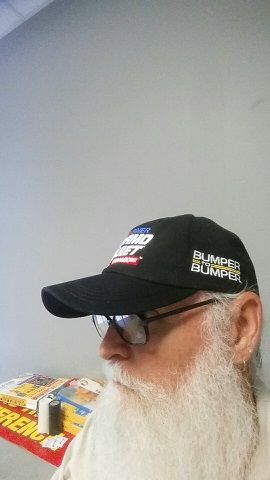 I’m delivering auto parts for Bumper to Bumper, full time…lol…........am I crazy? Yep!!!! But, I do like the job, like getting around to all the repair shops, and chatting with all sorts of folks. Shop time ?? I’ll try to pop in and out here n there. You’ll be their best employee. Stay safe out there. Stay safe Roger, there are a lot of nincompoops with drivers licenses out there ! goodon’ya ! The GOOD thing is that you are able do it ! The bad thing is that this site gonna be missing your supurb craftsmanship. I’m happy for you Roger, but also sad, as we will be missing all your beautiful work here. Good luck and stay safe. Good luck with the new adventure, Roger! Hope you find time to sneak back into to the shop to play. Keeps the juices flowing, Roger. I have known many people who went back to work just for the social contact and a more structured life. And the money doesn’t hurt any either, I bet. Well, it’s good to hear you’re still kicking, Roger! Have fun. Be safe. Find inspiration where you are! Well, Roger… I guess you just couldn’t take the old fashioned Job to keep yourself busy. Now, you have to go to work to get re-tired… Come home and retire again for the night! Nice to hear from you Roger. Best wishes in your new venture which sounds like a great fit for you. So that’s why we haven’t seen anything new from you!!!!! You did what????? Well, more power to you, buddy. I worked for a while at my “dream Job” (hardware sales at a major chain) and even did the Security Guard thing for a while. Both of those did not require me getting up to an alarm clock. Nowadays the only thing I want to HAVE TO BE AT is…......................hmmmmm, actually nothing…..LOL. Good luck, Roger. They have one heck of an employee. As long as you enjoy doing what you like, it’s not work. Go out and enjoy the world again, we will be here when it’s time to come home. Best of luck. Don’t take too long Roger, you will be missed buddy. Roger, I wish you well. Glad your health and vitality will let you do the job. I am sure you will be their most reliable employee, and that they are lucky to have you. Confucius says: “Find a job you enjoy doing, and you will never have to work a day in your life.” It is nice to have options in life. Have a great time with you new job. Now you will get to retire twice!! i was just talking about the guy who started Bumper to Bumper and I don’t remember who they told me it was, but it is a great business! !